The passenger compartment remained stable in the frontal test. Dummy readings showed good protection of the knees and femurs of both driver and passenger. Toyota showed that a similar level of protection would be provided to occupants of different sizes or those sat in different positions. 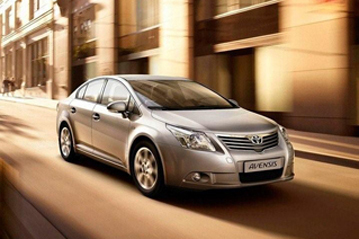 The Avensis scored maximum points for all body regions in the side barrier test. In the side pole impact, the dummy was loaded in a way which is unrepresentative of a human and the car was penalised. Combined with the rib deflections measured in the test, protection of the chest in this test was rated as weak. However, protection against whiplash injuries was good. Based only on the dummy responses in the tests, the car scored maximum points for protection of the 3 year infant. For the 1½ year old, Euro NCAP awards fewer points for a forward facing restraint than for a rearward facing one but the dummy readings were all good. The passenger airbag can be disabled to allow a rearward facing child restraint to be used in that seating position. Clear information is provided to the driver regarding the status of the airbag, essential to the safety of a child or adult occupant. Moreover, a clear warning is given of the dangers of using a rearward facing child restraint in that seating position without first disabling the airbag. The bumper provided good protection to pedestrians' legs. In most areas likely to be hit by the head of a struck child, the bonnet was also rated as good. However, the bonnet provided predominantly poor protection to the head of a struck adult.